The OMNI Draw Bar Hitch transforms your tractor's 3 point draw bar into a universal trailer hitch platform. You can use your trailer hitches and accessories from your truck or auto receivers. The 2" receiver hitch is a universally accepted method for trailer transport and many other trailer hitch items. 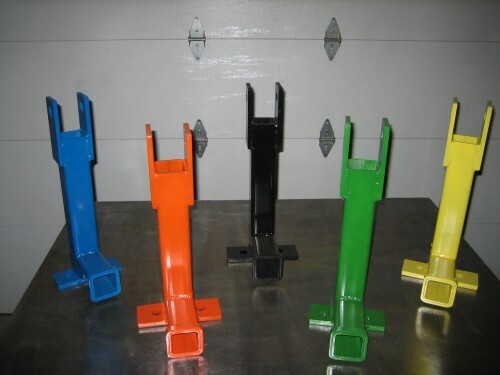 The OMNI Draw Bar Hitch has a 1/2" x 2 1/2" x 7" flat stock mount that bolts to your tractor's draw bar. A 2 1/2" x 2 1/2"x 3/16" square tube trailer receiver is welded to the draw bar mount. The top link ear tabs are 2 1/2" x 2 1/2" x 3/8. It is finished with an implement enamel paint. Heavy duty materials and MIG welding produces solid and stable attachment for your tractor. We are confident when you compare the OMNI Brand to similar trailer hitches on the market our workmanship and the construction materials we use will standout from any of our competitors products. Like my dad used to say "We don't have enough time to build it twice so let's do it right the first time"! This Item includes one OMNI Standard Duty Draw Bar Hitch and two 3/4" bolts, nuts & lock washers, one 3/4" top link pin & lynch pin and one 5/8" bent trailer hitch pin & keeper.You will need a Cat 1 or 2 draw bar with 2" on center holes to bolt it to. Just got the draw bar hitch today in Kubota Orange and mounted it up to BX2230 effortlessly and built as advertised. Steel frame and hitch holes aligned perfectly to draw bar holes. Bolts provided nice bonus so you don't have to root around for your own. Hitch pins were also provided which allows you to bolt up and go! Hitched up to a 5000 lb boat and piece of cake to move in pole barn. Well built and finished. Welds clean and crisp. Paint close color match to Kubota Orange. Recommend to anyone who wants to use subcompact to move trailers around. I could not believe my eyes when I opened the box. I was expecting some Chinese look alike at this price. Instead a well built solid hitch was there. I have not used it much but from the looks of it I won't have any problems.